Audacity is used by music professionals for mixing and re-mixing music – it has a sophisticated range of options. However, you can use it for basic audio recording. A similar analogy is your own computer which often has lots of bells and whistles that you don’t ever use. 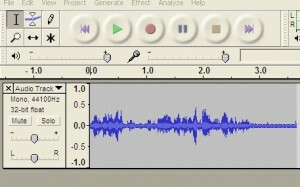 The above image is a screen shot of an audio capture with Audacity. You can see the simple buttons for rewind, forward, record, pause, stop and fast forward (just like any video player/recorder). To edit, you just highlight the piece you want to delete (for example, a cough or a silence) and it is removed from the recording. The secret as in a lot of social media marketing is to start slowly and then expand your learning edge. Try out some short recordings first and have a go at editing. Once you are comfortable with that you can extend the recordings and/or add music. You can add music to the beginning and/or end of your podcast if you want. Alternatively, you can play music in the background of your podcast. Here’s a sample of an early podcast I produced. Here I have used Ginny Culp’s free audio player to display and play the podcast. In a recent post, I highlighted the value of podcasts in providing you with another channel for communicating to customers, building your relationships and marketing your small business. Audacity makes this easy by providing you with a tool to create a professional podcast at no cost.